Bitcoin is a significant innovation. A decentralized, peer-to-peer electronic currency and payment system all in one. It’s secure, enables anonymity, and is censorship resistant. One of its most disruptive features is that it passes control of currency away from government and central banks to individuals. We the people, are no longer dependent on governments and their central banks for our currency. Bitcoin enables anonymity and avoids dependence on trusted third parties. However, the majority of Bitcoin based systems in place today, do not follow these same principals due to attempts at regulation and the lack of fully decentralized solutions. Many services allow you to buy and sell bitcoin, but they are regulated. These services enact money-laundering restrictions which require you to reveal your identity and record every one of your transactions. Bitcoin exchanges require your funds to flow into and out of exchange owned wallets, which require your trust and are frequently mismanaged – think of Mt.Gox. So while bitcoin is fully decentralized, most currently established bitcoin related services are fully centralized and designed to be trusted third parties. 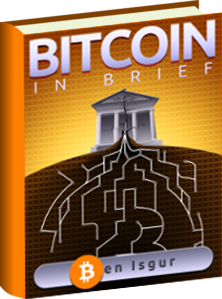 Effectively removing the intrinsic benefits of the Bitcoin system. I was excited to learn of Bitsquare, an open-source, peer-to-peer (P2P) application that allows anyone to buy and sell bitcoin in exchange to national (fiat) currencies or alternative cryptocurrencies. Bitsquare protects individual privacy by using a custom P2P network over Tor, in which every user is a participating node. Bitsquare is a cross-platform application that runs on Linux, OS X, and Windows operating systems that provides an easy-to-use, intuitive user interface. Bitsquare is a P2P bitcoin exchange. You can buy or sell bitcoin in exchange for other crypto-currencies or national (fiat) currencies. For example, ether, (the Ethereum crypto-currency) can be exchanged for bitcoin. If you want to buy ether, you sell bitcoin. If you want to sell ether, you buy bitcoin. Bitcoin is always on one side of a trade-able pair. My primary interest is in trading crypto-currencies, and I was really excited to hear about the new Decentralized Autonomous Organization (DAO) model popularized by Ethereum. One really interesting aspect of the DAO model involves expanding this new digital economy, beyond just crypto-currencies, to include what I refer to as, cryptoequities. 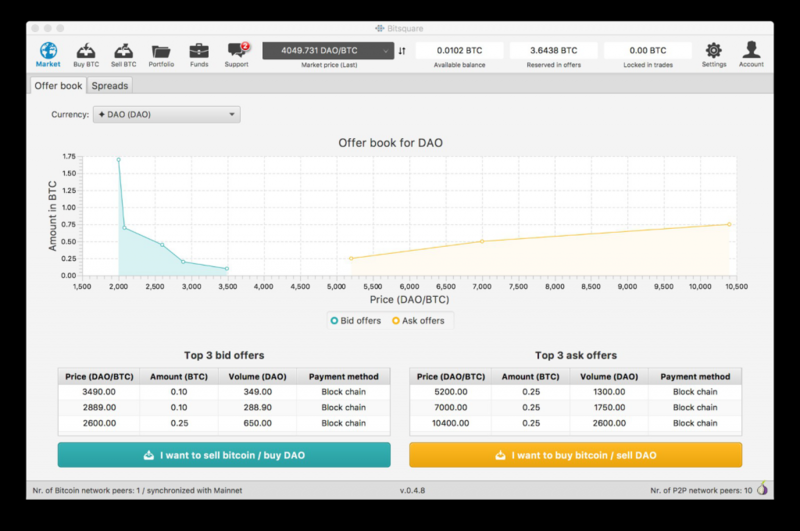 Since DAO tokens are similar to equity shares, I asked myself, why couldn’t we exchange DAO tokens for bitcoin using the Bitsquare application? So I contacted Manfred Karrer, the founder and lead developer of Bitsquare, and asked him if he could add The DAO and Maker DAO (MKR) tokens to Bitsquare for trading. This resulted in the release of Bitsquare version 0.4.8 that now supports crypto-currency and crypto-equity trading. I see this new DAO model as an improvement over the traditional organizational structures formed for investments purposes. How easy is it for someone in the USA to directly purchase common shares in a company based in another country? How many middlemen must one go through to do so? How many regulations exist that prevent you from doing so? Equity stakes through DAO tokens, provide a much more efficient and effective approach to equity investment on a global basis. I noticed a question in The DAO forums where an individual asked: if DAO tokens were held by an exchange, could the exchange vote those tokens on The DAO proposals rather than the individual who ultimately owns the tokens? This would not be an issue on Bitsquare because the trader/owner never transfers tokens to the exchange. Tokens are only transferred as a result of a change in ownership (the way it should be). Traders actually trade P2P on Bitsquare. This is a first of it’s kind! • You don’t have to sign-up. • You don’t have to reveal your identity. • Your identity is protected on the network through Tor hidden services. • There is no transaction trail for anyone (including the IRS) to follow. • Trading fees are low. • You always maintain complete control of your funds. • It provides a fully distributed arbitration system for dispute resolution. Bitsquare enables financial freedom and financial privacy for individuals on a global basis while significantly reducing counter-party risk. My hope is that Bitsquare will provide a fully decentralized reference model for others to imitate as they deliver crypto-asset related services. I encourage interested readers to visit the Bitsquare web site at https://bitsquare.io to learn more about the software, read the white-papers, interact with the community in the Bitsquare forum, download the free software, then start experiencing the real free market. Doug is a contributor to the Bitsquare project. 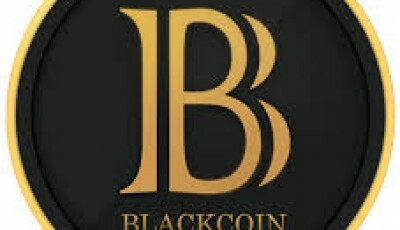 Disclaimer: CoinReport does not have any material connection with Bitsquare. Views and opinions expressed in this guest article do not necessarily reflect the views and opinions of CoinReport or any of its editors and writers. CoinReport is neither encouraging nor discouraging readers to use Bitsquare with the publication of this guest article. Hi Tabish Faraz, thanks for post. I’m trying to learn and here I found a lot of useful information. I am moderately sure I’ll be informed plenty of new stuff right right here!